Film star and record breaker! Ever since Tom Cruise rode the Kawasaki GPz900R to such acclaim in the film Top Gun I had hankered after Kelly McGillis a big, fast Kawasaki super bike. The Kawasaki GPz900R, like the film, was a winner, being the first production bike to reach 150mph and it dominated the production class at the Isle of Man TT at the time. Some fifteen years later I was lucky enough to own another Kawasaki’s record breaker, the ZZR1100 which held the record for the world’s fastest production bike for nearly a decade. 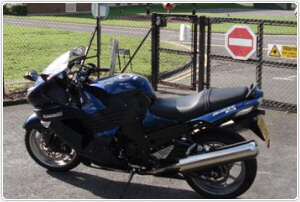 A short dalliance thereafter with Suzuki’s Blackbird eater saw me return to the awesome ZZR1200 as a personal bike. So having covered in excess of 25,000 miles on the ZZR1100 and ZZR1200 throughout Europe and the UK and some 8,000 miles on a Hayabusa, I feel somewhat qualified to comment on Kawasaki’s next record breaking bike the ZRR1400. Billed as “The most powerful street bike in the world”, Kawasaki’s undoubted aim with this their most powerful engined street bike ever was to turn a certain motorcycling bird of prey into chicken meat and claim again the “Top Gun” crown. Now the ZR1400’s top speed is limited to 186MPH (in standard production form), so it’s an arguable point if the ZZR1400 is now the worlds fastest production bike, but it sure is the most powerful. With the ZZR1400 producing maximum power with ram air of 147.kW (200 PS), Kawasaki can rightly claim to be top gun in the power stakes again! Film star looks and pulling power? Now looks are very much in the eye of the beholder, but one cannot fail to be impressed by the sheer presence of the ZZR1400. Where ever we parked the bike up on test it attracted a crowd and much comment on its looks. The general consensus was everybody liked the menacing front end with the daylight inducing quadruple projector beam headlights and the stylish side lights and the imposing central ram air duct. The rear end met with similar favourable comment, with the unique “V” design LED tail light and the gorgeous twin exhausts, similar to those of its worthy predecessor the ZZR1100. However it was the side on view that created the controversy, some onlookers liked the fined plastic side panels, (said to aid aerodynamics) others weren’t so sure. But the Metallic Ocean Blue paintwork was a real winner, once the sunlight hits this paintwork the bike just seems to light up. One thing is for sure the ZZR1400’s looks have pulling power and while it may not be a pretty boy film star, it’s more in the Arnold Schwarzenegger, Terminator guise, its menacing stance and noteworthy performance command respect from and amongst your motorcycling peers. 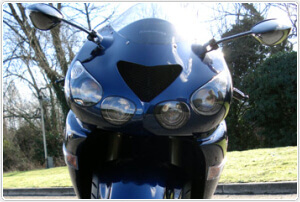 The ZZR1400 – a long term star? It was with some trepidation that I set out on my first ride on the ZZR1400 from Kawasaki’s UK headquarters. A bike with this much power automatically deserves respect and careful use of the throttle, until you get use to handling 200PS! However such trepidation was ill founded. What you are immediately impressed by, is how silky smooth the power delivery is on this bike and how docilely it can be ridden. Below 4,000 RPM the power delivery is comparatively soft, I stress comparatively! 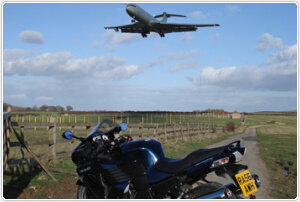 As 4,000 RPM equates to 80MPH in 6th gear, you could just bimble along never experiencing the tremendous adrenaline and power rush that comes from letting all 1,352 cubic centimetres of this digital fuel injected in line four cylinder Kawasaki engine lose. However wind the throttle above 4,000RPM in any gear and this bike suddenly comes alive, hurtling its way to the 11,000 RPM redline faster than you can say “FAST”. Be brave enough to try this in the lower gears and you can feel the G forces trying to push your eyes through the back of your helmet. This bike is quick; very, very quick, but also it’s deceptive because the power is delivered so linearly and so smoothly. In some ways it doesn’t feel as fast as it actually is, but one look at the clear red on white speedo and tacho, will leave you in no doubt as to how fast this bike can travel. Somewhere around 6,000 RPM the bike gets a second wind (it’s hard to be exact as I was looking at the road), presumably because the ram air is now at full bore (or the afterburner’s switched in! ), the acceleration lifts from supersonic to warp factor ten. If adrenaline inducing action is what you want this could be the bike for you. Combine this with the fantastic induction raw from the ram air and the characteristic Kawasaki exhaust howl and you have a performance package that I’m sure many will find hard to resist. However jaw dropping action does necessitate the need to be able to press the stop button occasionally and the ZZR1400 does not fail to impress in the stopping department. The dual radial mounted 4 piston front brakes combined with the single twin piston rear brake which bite on large diameter petal brake discs bring the bike to a fast but fuss free stop. Combined with excellent grip from the Bridgestone BT014 radial tyres this bike can be persuaded to stop with minimal brake lever pressure from near warp factor ten with the same degree of braking performance as the bike has power performance. For those who want even more braking assurance an ABS equipped model of the ZZR1400 is also available. Now star bikes of this class have had a history in the past of being a little on the heavy side, but apparently not so with the ZZR1400. 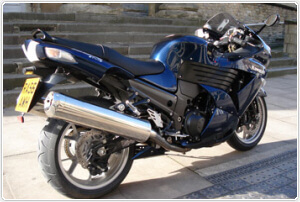 If there’s one criticism I could weigh at my old ZZR1100 it was its weight and the top heaviness. The ZRR1400’s dry weight is down to a respectable 215 kg, but it’s how this weight feels when the bike is moving that is key. Mass centralisation is a buzz phrase that’s being bandied about by most manufacturers these days and Kawasaki is no different. Apparently the ZZR1400’s engine and chassis components have been designed to maximise mass centralisation. What this means, unlike its ZZR predecessors is that the weight is carried much lower down and centrally, giving the bike a much more balanced feel and removing that top heavy tendency. It makes the bike feel very planted and composed. The only time you really notice the weight is when manoeuvring the bike in car parks, once the bike is rolling its fairly agile. In fact it’s quite an accomplished handler in heavy town traffic, as much as out on the open road. I found the ZZR1400 has excellent traffic manners which are aided by its silky smooth power delivery, light clutch action and well mannered gear box. Many motorbikes these days suffer from a snatchy throttle and power delivery below 30MPH caused by the current emission requirements; not so with the ZZR1400. It can be trickled through traffic at walking speed or filtered through dense traffic with ease. I think the ZR1400’s excellent manners are not only down to its smooth power delivery but also to its awesome torque. This bike delivers a massive 154 N.m (15.7 kgf.m) of torque at 7500 rpm, whilst almost two thirds of this is available from as low as 2000 RPM, aiding its traffic tractability and its awesome acceleration off the line. However whilst many will buy the ZZR1400 for its straight line and speed and acceleration, you will be pleased to know that this bike has handling that allows you to enjoy this performance on the twisties as well. The handling on the ZZR1400 is very fluid and composed and certainly takes less counter steer to achieve lean angles that would have taken serious effort on the ZZR1100 or even the ZZR1200. In the dry the full width of rubber on the Bridgestone BT014’s can be fully explored with confidence. However in the wet, not with standing current tyre technology, I treated the throttle with respect. I have to admit to finding the front end just a little vague and floaty in the wet, but in contrast the back end felt like it would never let go. The bike is at its very best on long A road sweepers and whilst it can be hustled around the country back roads, I did find it had a tendency to run slightly wide on the very tightest of bends. However the bike is not easily shaken off its cornering line because on the back roads it is the bikes suspension that really shows off. This is one of the first bikes I’ve ridden for some time that is equally as good at softening out the long slow undulations as well as the short sharp shocks occasioned by poor road surfaces. The suspension performance from the inverted fully adjustable 43mm cartridge front forks and uni-trak linkage rear suspension is first class. The bikes handling is also admirably aided by the ZZR1400 having an all new aluminium monocoque frame evolved from that first used on the Ninja ZX-12 R.
However all this performance and handling is no good if you can only spend 90 minutes in the saddle, before you have to peel yourself off the bike to relive aching limbs and a sore behind. So it came as a pleasant surprise to find the ZZR1400 is a massive improvement on both the ZZR1100 and ZZR1200. On my old ZZR1100 I found it gave me wrist, forearm and shoulder ache after a couple of hours of riding and I have to admit to ditching the stock saddle on my ZZR1200 after one week of ownership for something more comfortable. No such issues with the ZZR1400. The stock seat is supremely comfortable, I spent several whole day riding sessions on the ZZR1400 without any saddle soreness or discomfort whatsoever. Also gone are the aches and pains, the riding position only tips you slightly forward, it looks a more sporty position than it is. Hence no aching wrists etc., this combined with the lower weight and smooth power delivery mean the ZZR1400 provides a level of ride comfort which sets new standards for a ZZR. Plus they’ve put rubber insets back on the foot pegs for extra foot comfort and deeply sculpted the tank for excellent and comfortable knee and leg positioning. The bike should also suit those of a shorter stature as the low seat height of only 800mm makes it easy to get both feet firmly on the ground. Now no block buster these days is complete without the special effects and the ZZR1400 abounds with technical wizardry and new features. From its all new engine evolved from the Ninja ZX-12R, its new frame and suspension, the bike has a host of hidden features. The fuel reservoir is located at the back of the petrol tank which in-fact extends below the seat to aid with mass centralisation. The newly designed wheels have centre ribs which are slightly offset, so that when it comes time for a change of rubber, the tyre balance weights can be located at the wheel centreline. 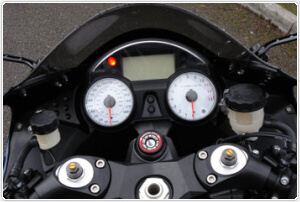 In addition to the analogue speedo and tacho the bike has a very easy to read multi-function LCD digital display unit which includes a fuel gauge, gear position indicator, dual trip meters, odometer and clock. The unit can also display average MPG, constant MPG, battery charging rate and the fuel range in miles left in the 22 litre petrol tank. However the really technical wizardry here is the use of a CAN between the display unit and the ECU which inherently reduces the number of cables and allows the greater volume of information to be displayed and exchanged with the ECU, clever stuff! Aerodynamics is another area were the Kawasaki engineers have worked hard, this bike has a very low drag co-efficient with its wind cheating shape, I found the bike very stable at high speeds and surprisingly for a fully faired bike, largely unaffected by strong crosswinds. Throughout our 500 mile test we averaged just over 35 MPG, with our lowest tank full achieving 34 MPG and our best 39MPG. Now against these figures you must balance the performance you are getting which if this were a car would put you in the territory of the worlds top super cars. Based on my average fuel consumption the bike will do approx 170 miles till the tank is dry. Now I have read tests in the market place that say 50 MPG is achievable, all I can say is they mustn’t have explored the awesome performance this bike offers! A minor service is required every 4,000 miles and a major every 7,500 miles, however the real money saver is that valve clearances on this new engine now only need to be checked every 24,000 miles. Typical service costs are £180.00 and £299.00 respectively. A full valve check service is £399.00. Also the current on the road list price for this bike is £8,995, which doesn’t seem expensive for a bike offering this much performance. Now owning a ZZR1400 isn’t, I’m afraid, going to turn you into an instant Tom Cruise look-alike, however what it will do is enable you to ride the worlds most powerful production street bike in a package that delivers all that power in very useable fashion. Backed by a frame, suspension and brakes and ride comfort that enable its true potential (where legal to do so) to be fully explored. Doubtless the ZZR1400 will be the motorcycle to have for those that strive to ride a street legal bike that provides the ultimate in adrenaline pumping action. Will it become an icon like its ZZR1100 predecessor only time will tell, but based upon its current credentials it has all the ingredients to be a long term star.